You could argue that by trading on the inversion that you get the initial good money but by waiting for the next equivalent lunar turn then you might get good returns and it may be safer. i.e. …Last year in Feb the full moon(normally a buy) turned into a sell. The next sell (new moon) would have been 4th March. 29th July should have been a sell(new) but turned into a buy. Next buy 12th Aug.
7th Feb ..buy(full) turned into sell. next sell(new)21st feb ….. it lead to the first proper dip and poss start of sideways move in market…..just a thought. Just hypothesizing but it would be interesting to compare with data pre HFT-algos. No doubt when too many retail players are on the right side of the trade it flips. The only way this could be achieved is by flicking a “switch” for co-ordinated action. Otherwise, Ive been pondering the same question for a very long time. ‘course the big question now is: Will the inversion continue? Now that we’re beginning the part of the lunar cycle that is usually negative for stocks, will the uptrend reverse or will it continue in inversion mode? Yes …That is what I’m saying above. I agree it looks like a bounce scenario. If it trades 1292 again then it is then most likely the other one. Something that has been noticed is that crashes occur around lunar/solar pairs. Two pairs occur each year and crashes are very rare,therefore they cannot be causative per se. The interesting aspect is that tops before crashes occur at a new moon and/or solar eclipse as would be expected, but then the market would go down until the next new moon and or eclipse which would be a inversion and not expected. A general crash sequence is top on a new moon, drop until the next new moon, weak rally to the next full moon and then down hard for 4-6 weeks. Apparently the inversions in these cases shows a big change and inordinate weakness. Possibly inversions occur around the 2 solar/lunar eclipse pairs that occur each year (I haven’t checked) and occasionally a crash occurs. We are in the midst of an eclipse pair right now. Monday was a solar eclipse and the lunar eclipse is Jun 4. The final low has a strong tendency to be on a full moon. The 1st stage of a typical crash sequence should have been May 20 which wasn’t bad enough to be called a crash so maybe the worst is over. But there is enough variance that all clear can’t be called yet either. Jun 4 and the next full moon July 4 are worth watching. 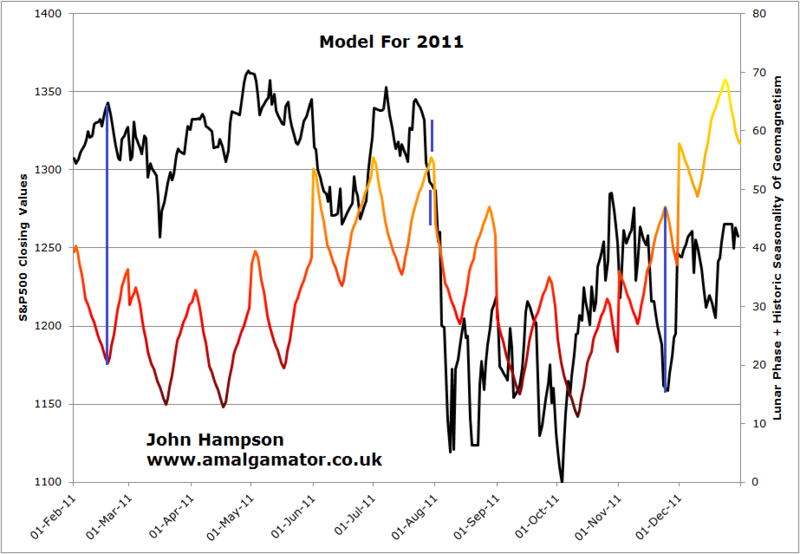 Good comments June 4 would line up well with my AstroCycle model and also longer term geometric support. Kent, yes there is something called the Puetz Crash Window. Puetz used eight previous crashes in various markets from the Holland Tulip Mania in 1637 through the Tokyo crash in 1990. He noted that market crashes tend to be lumped near the full moons that are also lunar eclipses. In fact, he states, the greatest number of crashes start after the first full moon after a solar eclipse when that full moon is also a lunar eclipse . Once the panic starts, Puetz notes, it generally lasts from two to four weeks. The tendency has been for the markets to peak a few days ahead of the full moon, move flat to slightly lower–waiting for the full moon to pass. Then on the day of the full moon or slightly after, the brunt of the crash hits the marketplace. The window is 6 days before to 3 days after the full moon. We just had a solar eclipse over the weekend. The next full moon will bring a lunar eclipse, so we have a crash window opening around that time. But again, crashes are rare, eclipse cycles happen twice a year, each cycle usually bringing both a solar and a lunar eclipse. Note that this cycle did not bring a total solar or lunar eclipse. The solar was an annular, and the lunar will be a partial. there is a similarity in the 3 last real crashes, in 1998, 2008 and 2011 (the ones after the ~6month cycle began around 1997). First there is a 6month cycle low (like June 2011), and then a failing 6month cycle – starting with a very weak rally and collapsing when it should rally more. This is not the case now (but could be later this summer). Right now we are trying to establish a 6month cycle low, and timewise it would be fine around here (allthough a bit early). Pricewise we should not make a significant lower low (or none at all) to keep a bullish condition. Thanks John and all – really insightful comments. There are cycle inversion because there are bigger cycles at play. Were just looking month to month. Short term could be bearish but in the longer term its still on a bullish path. As you have shown not everytime does it work out perfectly. that’s cause we are not in a perfect world. and jan i actually completely agree with your comments as in Oct. you’ll see ppl realize that the repulicans arenot going to renew the tax cuts. (just as they didn’t extend the student loans) Romney also said to wait till after the elections to lower the tax rates and the majority of wall street will realize Obama will win re-election. primaCayon, 28 November will be both lunar eclipse and full moon, hence a possible candidate for a bottom according to Puetz Crash Window? 13 November also a total solar eclipse date. … and actually I just realized that 13 November is both total solar eclipse and new moon, hence may be a better candidate for a cycle inversion bottom?